The mini skid steer attachments are quality built, multi-purpose attachments for all the building, landscaping, gardening and equestrian sector needs. The mini skid steer can be operated by a single individual, saving labour costs whilst the versatile attachments offer the perfect solution for the unique demands of various industries. Equestrian settings such as arenas and stables. Road and pavement installation and maintenance. Earth drilling for tree planting etc. Lifting pallets and other materials. Scooping sand, soil and rubble. Slabs, brick and block paving installation. Brushing and cleaning interior and exterior areas. 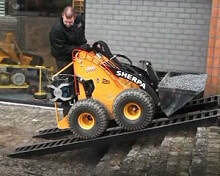 ​Choosing the right attachments will help to reduce costs and maximise the performance of the mini skid steer loaders. ​Mini skid steer roller brooms. Mini skid steer weed brush. Mower deck attachments are only suitable for the 150 mini loaders. Mini skid steer rotary tiller. Mini skid steer ripper hook. 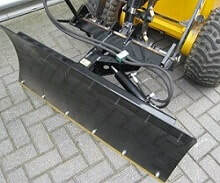 Mini skid steer snow pusher/feed scraper. Also available as hydraulic attachments. Mini skid steer trailer coupling. Mini skid steer lifting arm. 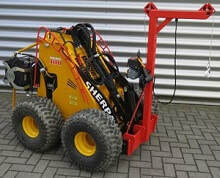 Mini skid steer mast with electric winch. 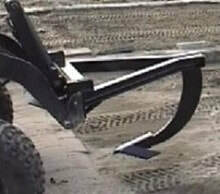 Mini skid steer ground leveller. 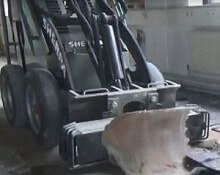 Mini skid steer carpet remover. Mini skid steer push broom. Mini skid steer hydraulic auger. Mini skid steer hydraulic breaker. Mini skid steer hydraulic tree grab. 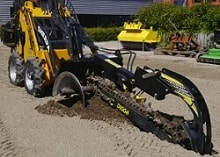 Mini skid steer hydraulic trencher. Mini skid steer hydraulic concrete mixer. Mini skid steer hydraulic curbstone-lifter. Mini skid steer vacuum lifting attachments. ​Call us on 0845 3731 832 for sale prices and more information. 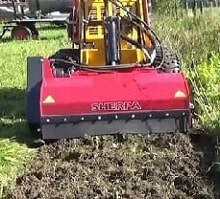 These hydraulic attachments are suitable for removing weeds between stones. These mini skid steer attachments are suitable for removing weeds between stones. The mini skid steer rotary tiller attachments are suitable for milling ground with stones and tall grass and will turn the soil over in no time at all. These attachments are valuable in the landscaping, gardening, renovating and constructing sectors, breaking up heavily compacted, rough soils, giving excellent soil preparation results and helping to create beautifully landscaped gardens. 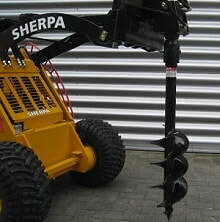 These powerful mini skid steer ripper hook attachments will break open stones and tiles. These mini skid steer attachments are able to rip tarmac, dislodge rocks from top soil, break hard soil for garden bed preparation and assist with shallow excavation, building, demolition and landscaping projects. This functional snow pusher/feed scraper is designed to move animal feed, straw, silage, snow and other loose materials. These mini skid steer attachments are perfect for farming and agricultural settings. The attachments however, are not suitable for pushing/scraping hard objects such as wood, gravel or stone. ​These functional, adjustable hydraulic snow pusher/feed scraper attachments are designed for moving animal feed, straw, silage, snow and other loose materials. These attachments are suitable for the 150-mini loaders. 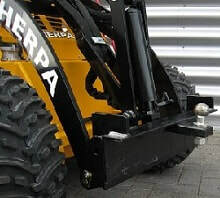 The trailer coupling attachments for the mini skid steer are also suitable for the 150-mini loaders and they are designed for moving trailers and similar around the farm, building or construction sites. These mini skid steer attachments will allow you to tow heavy loads or machinery without breaking your back. The mini skid steer lifting arm and hook attachments will help builders and landscape contractors to load, haul and transport loads of up to 2 tons safely and securely. 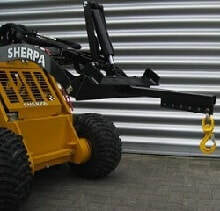 These mini skid steer attachments with exclusive certificated lifting hook and hoist chain can lift several weight loads and can be combined with stone clamps and suction cups for different uses. These mini skid steer attachments are suitable for loading, unloading, piling, pulling and hauling purposes. The mini skid steer mast and electric winch are the perfect attachments for building, construction and landscaping users. 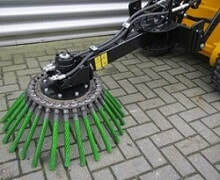 The ground leveller attachments are designed for levelling sand and gravel. The ground or land leveller attachments can be used for different construction and landscaping works such as foundation for a building, garden and landscape improvements and surface drainage. With the vertical rake, the top layer of the sand or grass plains can be loosened. 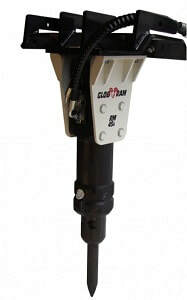 The mini skid steer carpet remover attachments will remove whole carpeting, carpet tiles, glue and more. These attachments are easy to fit onto the mini skid steer and are perfect for building and renovation projects. 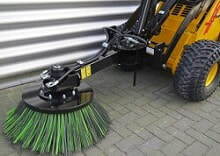 The push broom attachments are perfect for cleaning dirt, debris and more from paved surfaces. 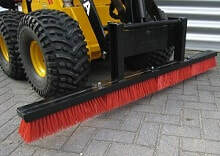 The mini skid steer push broom attachments can be used for sweeping parking lots, side paths and warehouses. The mini skid steer hydraulic auger attachments are perfect for drilling holes in sandy soil and digging post holes for planting trees. These attachments can be used for building, construction, gardening and landscaping projects. The optional high-torque auger head attachments with direct planetary drive will allow you to dig bigger holes in clay, gravel and sandstone. Please note it is necessary to mount a leakage pipe on the mini skid steer when you use these hydraulic auger attachments. Attachments designed for breaking rock, concrete and walls. The mini skid steer hydraulic breaker or hammer attachments work at low and elevated level without putting any strain on the mini skid steer or the operator, producing incredible results. The attachments are very useful for building, construction and demolition work. 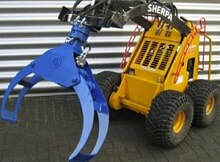 The hydraulic tree grab attachments are also known as log grabs or grapples. 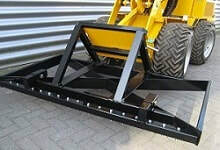 These mini skid steer attachments are ideal for grabbing several small trunks, logs, trees and any large timber. ​The attachments can be used in forestry, landscaping and gardening. The mini skid steer trencher attachments are designed to dig trenches for laying pipes or electrical cables, installing drainage, cut pavement for road maintenance and more. 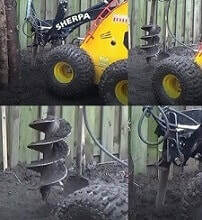 The trencher attachments are perfect for landscapers, builders and construction workers, cutting down the time and number of people needed to finish a working project. These concrete mixer attachments will also fit the 150-mini loaders and are suitable for combining cement, sand, gravel and water to make concrete. ​These mini skid steer concrete mixer attachments are a must have for builders, landscapers and gardeners. The hydraulic mixer attachments can do the work on site or be transported to the desired location with the mini skid steer. These effective curbstone-lifter attachments are very useful in the construction industry where once a hole has been cut in a concrete floor, the section can be raised and removed without needing to drill holes for eye-bolts. The mounting system allows easy installation and removal of these attachments. A hydraulic swivel head facilitates the turning of the attachments and they are operable by joysticks. ​These attachments exclude the vacuum unit and the suction cups. ​The mini skid steer vacuum lifting attachments make tasks much easier than using other methods, enabling hauling, gripping, lowering and releasing actions. ​The vacuum lifting technology offers a fast and safe way of controlling the lift, placing and manipulation operations of the product. These mini skid steer attachments are perfect for uses in the landscaping, construction, building and demolition industries. ​The attachments are compatible with the 150-mini loaders. 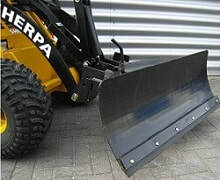 These attachments are designed to avoid friction when turning the skid steer on the pavement and are fully assembled. With this additional ballast block on the backside of the mini skid steer it is possible to lift more weight. Placing an extra ballast block on the backside of the mini skid steer makes it possible to lift extra weight. These skid steer attachments include hydraulic hoses. The mounting plate allows you to fit mini skid steer attachments onto the 200 and 300 mini loaders. These hydraulically driven attachments are suitable for the 100 mini skid steer and the 300-mini loader's curbstone suction lift. These are very useful tool attachments for lifting manhole covers. 10 cm higher than the standard suction lifter tool. These attachments can be operated by a single person for lifting tiles. These attachments must be operated by two users.